Stunning mid ivory star cloth and chocolate themed bell end exhibit, the James Bond award winning marquee lining and Custom Covers Showman's Show prize. 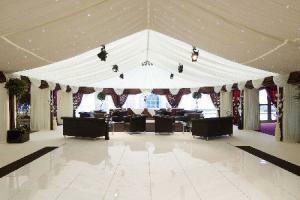 Southampton-based Custom Covers (1984) Ltd the UK market leader in the manufacture of marquee covers and decorative marquee linings, confirmed its position at this year's Showman's Show by winning Show prizes for the 12th consecutive year. Prize winning was on the menu too. 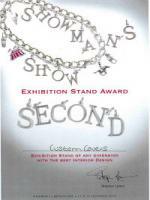 Custom Covers announced the winner of their own Marquee Interior Design competition 2007 which was awarded to Odell Brookes from Southampton Solent University. 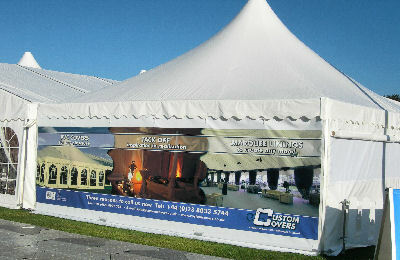 The use of digital printing as marketing tool for Marquee Hirers has become more prevalent in the last 18 months as the cost of digital printing has become much more affordable. 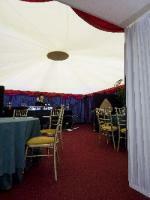 In this years show Custom Covers displayed a number of ways that Marquee Hirers can take advantage of this trend.